The first day of the NeoCreation Week has now begun! All this week on Neopets social media accounts, they will be posting a new contest at 10am NST. If you enter before midnight that day, you could win Comic Con codes! The first challenge is to create an image for a new trophy. NeoCreation Week has officially begun! 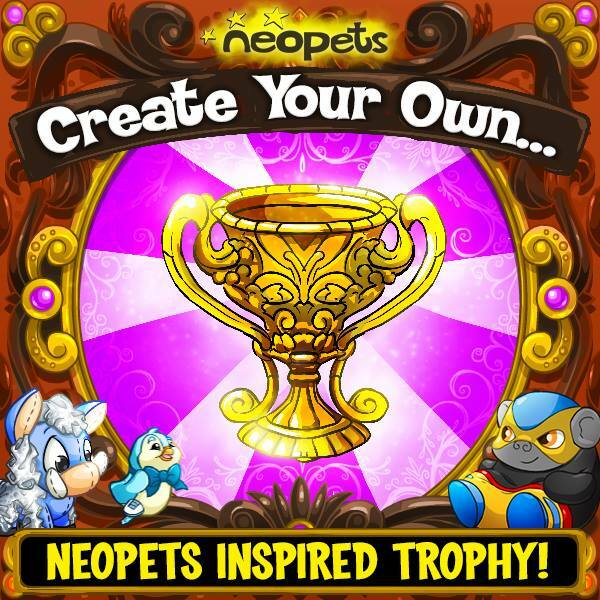 The contest for today is to create your own Neopets Trophy! Show how it’ll look and how people could win it on the Neopets site. Make sure you post it to your social media with the hashtags #NeoCreationWeek #MyNeoTrophy and have fun! Submit before 11:59 PM PST to be considered as a participant. All winners will be announced tomorrow at 10:00 AM PST along with the next contest. So get creating! This contest is open on the Neopets Facebook page, on the Neopets Twitter page, and on the Neopets Instagram page. You will need an account on one of the sites to enter, and remember to post with the required hashtags in order to qualify. Today's hashtags are #NeoCreationWeek and #MyNeoTrophy. UPDATE: Due to a higher number of entries received than they may have been expecting, winners will now be announced at the end of the week! However, you still must enter each day's contest by 11:59 PM NST.